I know, I know… I’ve been promising this write up for ages, but now it’s here! I’ve been trying to get it put together to help promote the Food 4 Kids program and fundraising event, especially since David Leite has sent a signed copy of his cookbook, The New Portuguese Table, as a raffle prize (either donate online or at the collection event Saturday, December 12, 2009 to be entered in the raffle). David’s website, Leite’s Culinaria, is proud of the fact that posted recipes get put through the steps by the extensive network of recipe testers. If it doesn’t work, it doesn’t get posted. If a recipe is posted, but readers are finding it really doesn’t work, it gets re-tested and often pulled. So, it stands to reason that his cookbook would undergo the same rigorous procedure. If there’s one mantra cooks follow (or should follow), it’s “Don’t attempt a recipe for the first time in front of company.” When you are making dinner (lunch, dessert, food gifts, etc) for people, even if those people are good friends, you want to present a dish you’re familiar with, so you’re not left with some weird thing in a dish that requires a) pizza delivery and b) delayed eating. Granted, I’ve fudged that rule a few times, but only on Cami – mainly because I know if something goes wrong I can just whip up something else for us to eat and we’ll be happy. And I always warn in advance, “This is a new recipe so it might turn out terrible”. Luckily, I think that may have happened once. Or twice. Okay, small confessions: I had made the green olive dip and goat cheese triangles before. And the chocolate chip cookies aren’t in the cookbook, but they are David’s recipe and they’re so good I had to make them. The green olive dip is really delicious: vibrant, tangy, creamy, and spreadable, it makes a good dip or spread. And, we had a beer that pairs perfectly with goat cheese, which is why the goat cheese triangles made it in. But the main course was all new to me! Which is what matters, right? Because if it fell flat or took longer to cook, we’d be in trouble! This was designed as a sit-down dinner. We had appetizers ready to go when people arrived, but I had timed the beef so that it should be ready by the time we were finishing the soup. And it was. 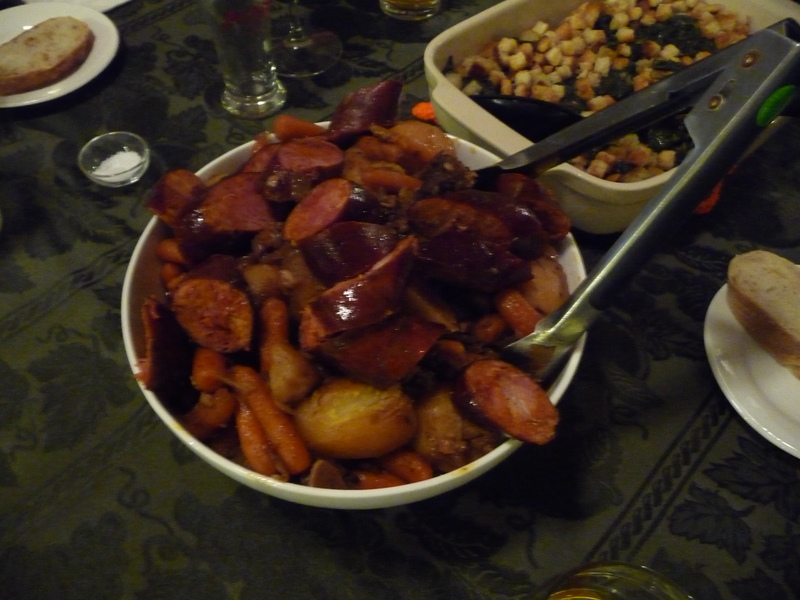 So, here’s what we enjoyed at our Pre-Holiday Dinner, compliments of The New Portuguese Cookbook. The green olive dip is in the bowl towards the middle. 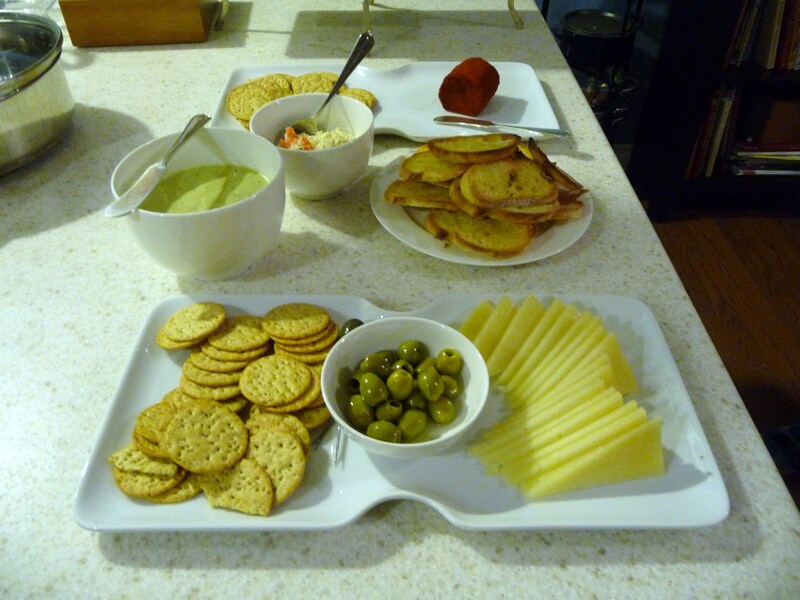 The rest of the nibbles were pretty much leftover things I had in the fridge. In the front, I put out a platter of crackers and Manchego cheese (it’s what I had) and the rest of the green olives from the dip recipe. I had also sliced a baguette, drizzled them with olive oil, and toasted them so people could spread the olive dip on them. I had leftover crab from the gazpacho recipe, so I turned it into a crab salad that we ate for lunch. What’s in the bowl is what was leftover from that. In the back is a plate of more crackers and some goat cheese I had rolled in sweet paprika. Not too shabby, huh? For the green olive dip, I used Spanish olives from the bulk olive bar at Whole Foods. The base of the dip is a milk “mayonnaise” (also in the cookbook) – instead of using egg yolks, you use milk and then emulsify oil into that. The green olives add a salty tang and there’s a hint of garlic in there, too. I love it and happily ate leftovers on everything for a couple of days after the party. Yes, you’ll notice those are rectangles. That is completely due to my inability to cut straight lines, which left me with uneven squares. Uneven squares don’t make good triangles, but they make decent rectangles. 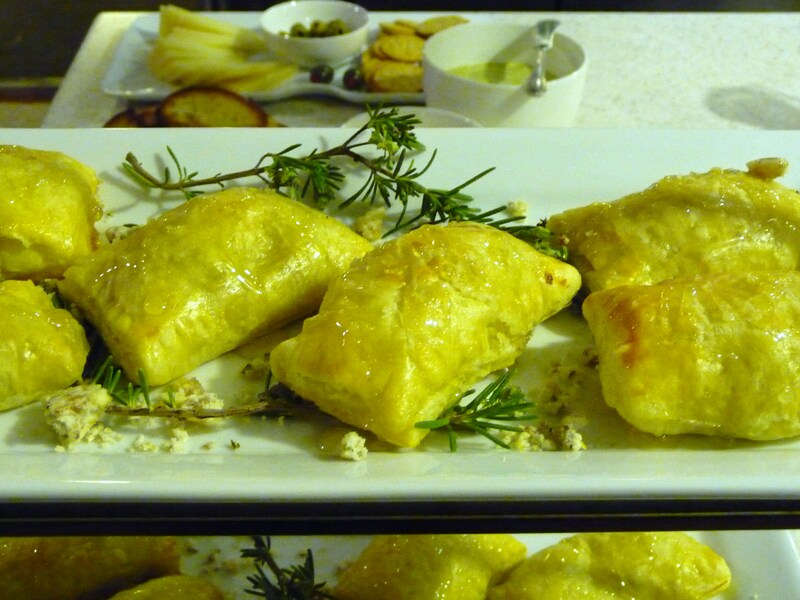 These are filled with a mixture of goat cheese, walnuts, rosemary, and thyme, then brushed with an egg wash, baked, and drizzled with honey and sea salt. You get crispy soft pastry, a creamy filling with a crunch (from the walnuts) and this salty sweetness on the outside. I could eat a dozen of these, easily. When we were in New York, we went to Newark, NJ to stroll through the Portuguese neighborhood. 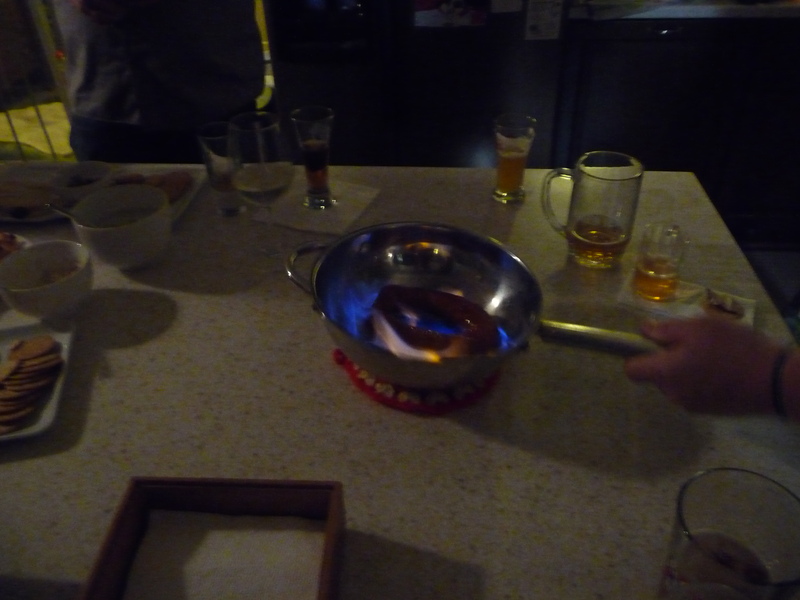 When we stopped for lunch, we saw a table with a flaming sausage! Since we had brought back some good linguica, we thought it fitting to see if we could set fire to a sausage without causing too much damage to the house. I would recommend testing your liquors first to see what lights easily. We ended up using some of Travis’ Scotch. 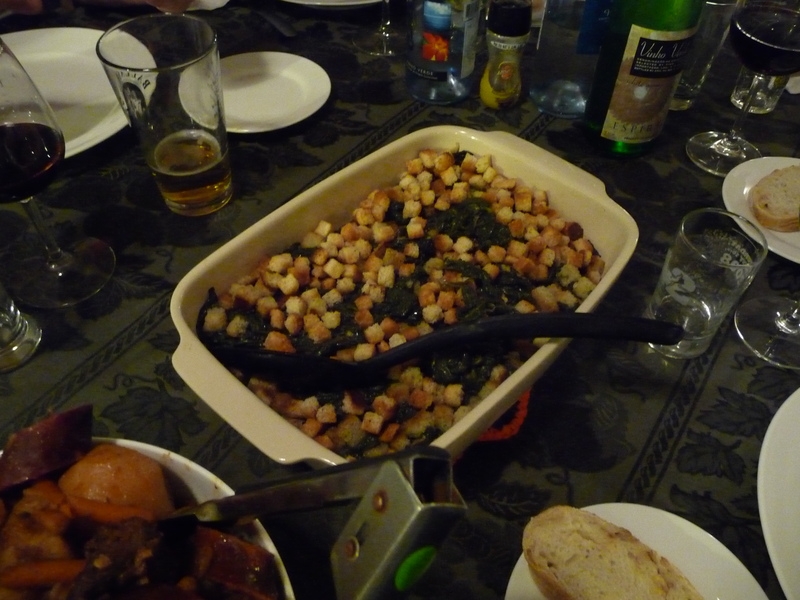 We also didn’t have the traditional vessel, so we used one of my stainless steel pans. As you can see, it’s very visually appealing, and you end up with a crispy sausage that is slightly sweet from the burned off alcohol. I had never made a gazpacho before. I think I was under the impression that I didn’t like cold, savory soups (cold, fruit soups are a different story). I was also skeptical that all the bread and almonds would result in a soup that wasn’t grainy or clumpy. 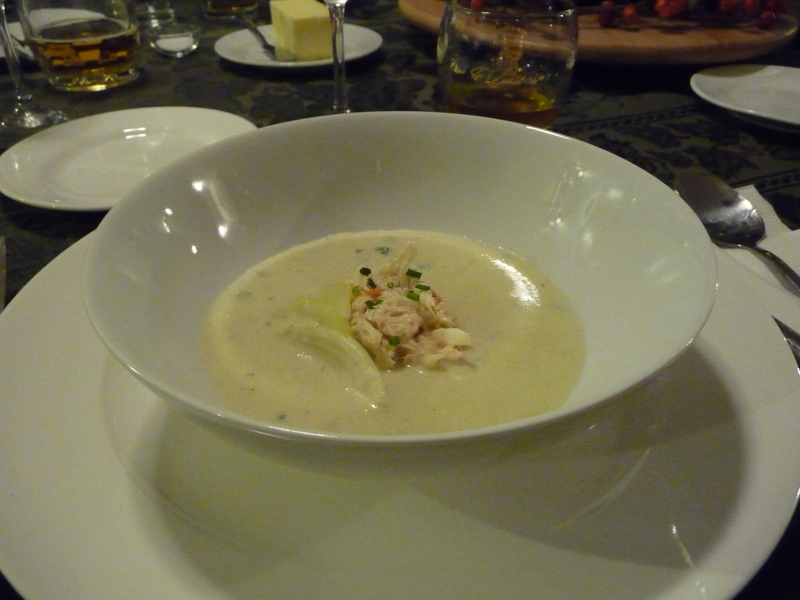 And, yes, I realize this may be better suited for a summer meal rather than fall, but it was one of the few soups recipes that allowed us to plate the dish with the crab salad in, and then pour the liquid soup on top of it. See, when we were in New York, treating ourselves to fancy-schmancy meals, we kept getting impressed by these soups that arrived with tasty morsels on the bottom and a silky liquid that surrounded them. We wanted to do it at home, and this ended up being our choice. 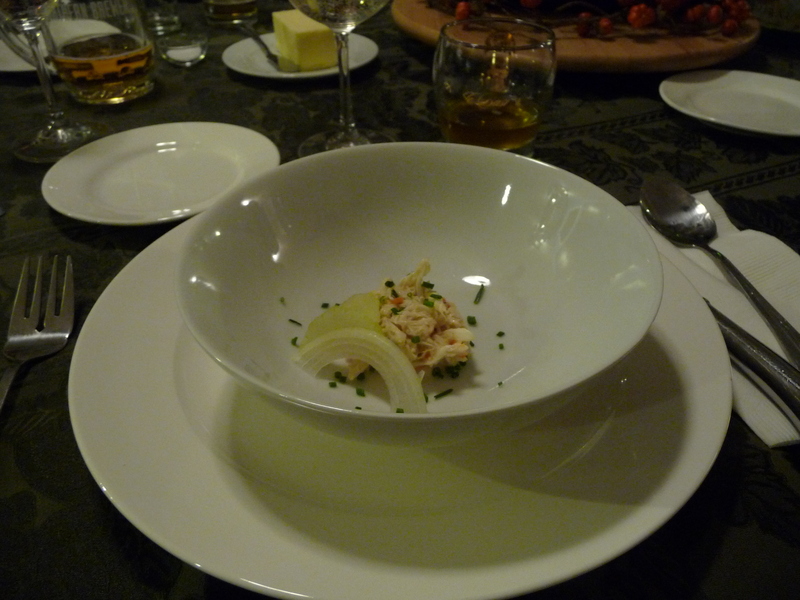 The crab salad works well here, melding into the soup to give the dish a little more substance. The gazpacho itself is light and not grainy at all. Definitely make sure you add enough salt to bring out all the subtle flavors. We ended up with no leftovers on this course, but I wish we had. The braised beef was delicious. Meltingly tender and flavored from braising in wine, garlic, and alongside chourico. By this time, we were all getting so full, but everyone agreed it was so good. I would have eaten the leftovers for lunch, but Travis beat me to it. You may notice the breadcrumbs on my spinach are a bit large and perfectly cubed. I didn’t have time to make the cornbread in the cookbook (it’s like a yeasted bread made with cornmeal), but I did have cornbread stuffing mix and I think it worked in a pinch. It gave a little crunch to the spinach and there wasn’t much left by the time dinner was done. Almost done… we’re at dessert! The nice things about both these desserts is that you have to make them in advance. The Orange Olive Oil cake needs to be baked at least a day before you plan to serve it. Trust me… you may think you want a warm, fresh-out-of-the-oven cake, but you don’t. You want a room-temperature cake that has had at least a day to let the olive oil and orange flavors meld, soften, and seep into the moist cake. It stays moist (probably due to the amounts of olive oil) and it just keeps getting better. We kept slicing pieces off the cake for days until we finally sent it into work. 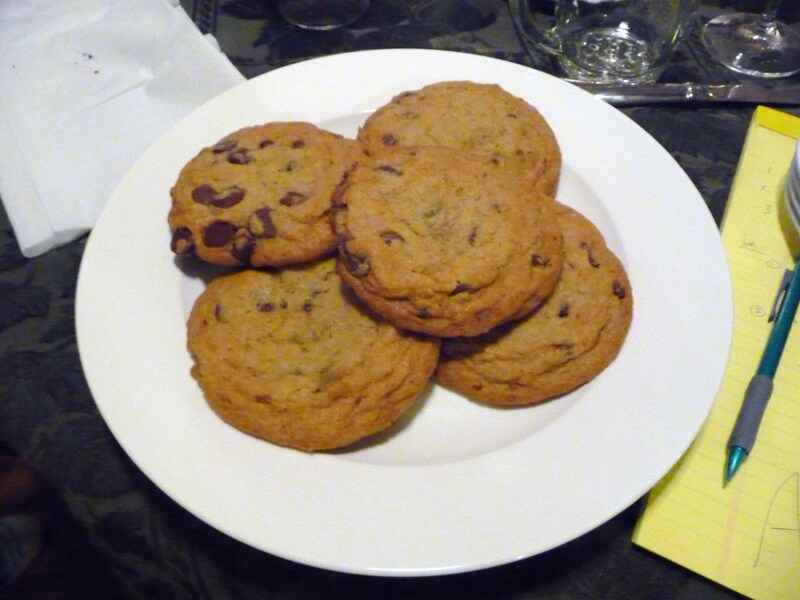 The cookies have made their rounds on the Internet and people keep posting about their famous/popular/best cookies, but these are my favorite. You make the dough up to 3 days in advance and then bake them up into huge cookies. The long rest lets the sugars and moisture meld into the flour (or something like that – go read about it) and because of the size, you get a cookie that is crispy on the outside, chewy in the middle layer, and then soft in the dead center. Plus, there are these layers of chocolate interspersed into the cookie. It’s heaven and definitely calls for a glass of cold milk. Sometimes I freeze hunks of dough so I can bake up a couple of cookies on a whim. They’re still good (as no warm cookie could be bad) but they aren’t as good as the ones made from “fresh” cookie dough. So… I managed to convince myself that all the recipes in the cookbook work, which is comforting since, as I mentioned, there are quite a few that I haven’t tried yet. Now I can just pick one at random and know it’ll end up tasty. This entry was posted in books, food, recipe testing, recipes and tagged dinner party, new Portuguese table, recipes. Bookmark the permalink. Leanne, Wow! What a post and what a feast. I’m so glad the recipes turned out as well as they did for party. As you said, each was tested over and over again, and your contribution to the testing process made them really top-notch. My Momma’s braised beef is one of my favs. In fact, I leave today for a five-day book tour back home in Massachusetts, and Momma Leite’s making this for me. 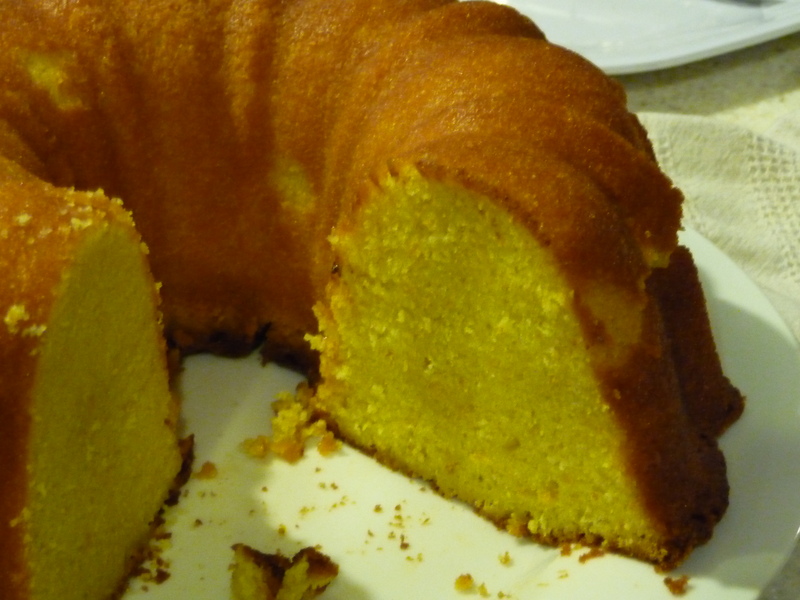 And, of course, the orange-olive oil cake is something I can’t stop eating. One variation (that’s not Portuguese): make a glaze of OJ and confectioners’ sugar and drizzle it on top. Perfection. I recently made a pot roast in a pressure cooker (testing it out to see if I want one) and the flavor was just lacking. It probably would have improved with a blast of high heat and sauce reduction, but that would have defeated the purpose of a “quick” meal! It did make me miss Momma Leite’s Braised Beef, for sure! Lucky you, to have it waiting for you! I did and it was delicious! I love the phrase “meltingly tender!” I just had lunch but now I’m hungry again. Sounds like your dinner party was a huge success! We were all so full by the time it was over! Surprisingly, there weren’t that many leftovers!